Now that we have sequenced the human genome, what does it mean? In The Postgenomic Condition, Jenny Reardon critically examines the decade after the Human Genome Project, and the fundamental questions about meaning, value and justice this landmark achievement left in its wake. Drawing on more than a decade of research—in molecular biology labs, commercial startups, governmental agencies, and civic spaces—Reardon demonstrates how the extensive efforts to transform genomics from high tech informatics practiced by a few to meaningful knowledge beneficial to all exposed the limits of long-cherished liberal modes of knowing and governing life. Those in the American South challenged the value of being included in genomics when no hospital served their community. Ethicists and lawyers charged with overseeing Scottish DNA and data questioned how to develop a system of ownership for these resources when their capacity to create things of value—new personalized treatments—remained largely unrealized. Molecular biologists who pioneered genomics asked whether their practices of thinking could survive the deluge of data produced by the growing power of sequencing machines. While the media is filled with grand visions of precision medicine, The Postgenomic Condition shares these actual challenges of the scientists, entrepreneurs, policy makers, bioethicists, lawyers, and patient advocates who sought to leverage liberal democratic practices to render genomic data a new source of meaning and value for interpreting and caring for life. It brings into rich empirical focus the resulting hard on-the-ground questions about how to know and live on a depleted but data-rich, interconnected yet fractured planet, where technoscience garners significant resources, but deeper questions of knowledge and justice urgently demand attention. Chapter 2 The Information of Life or the Life of Information? Chapter 3 Inclusion: Can Genomics Be Antiracist? Chapter 4 Who Represents the Human Genome? What Is the Human Genome? Chapter 5 Genomics for the People or the Rise of the Machines? Chapter 6 Genomics for the 98 Percent? "This book is a compelling introduction to the interplay between personal genomics, precision medicine, and social justice. Reardon defines the post-genomic condition as "the question of the uses, significance, and value of the human genome sequence.” In eight highly readable chapters, she critically assesses numerous concerns, including the relatively brief history of global genomics research with an emphasis on programs and initiatives in the US; how race is an issue in genomics research, both socially and scientifically; and whether genomics research benefits the general populace or predominantly supports researchers and the businesses that have developed to create and promote genomics-based technologies. An extensive bibliography and notes sections for each chapter offer options for further study. The text is written conversationally and with anecdotes, and although it can be a bit dense at times, the historical narrative and ethical questions are a fascinating insight into a rapidly evolving, wide-ranging scientific field with significant sociological implications. Recommended." "Reardon lays out a bold vision for genomics's potential. She probes the value of the human genome from a utilitarian perspective, contending that human DNA and data constitute the raw resource of our times: a commodity whose value is to be quantified as biocapital. Thus, the postgenomic condition is about using information and knowledge as the currency from which to build a 'genomics that is of, for, and by the people'." "Across the book, Reardon insightfully explores a number of cases through which we can follow how human genomic programs are operationalized and negotiated across different stakeholders, mostly in the US and Scotland. . . . 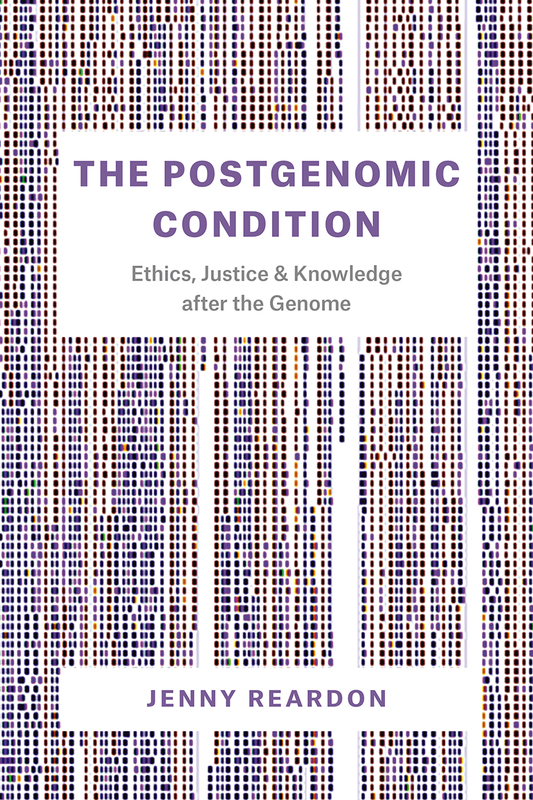 The book is excellent when Reardon discusses the moral ambition and democratic ambiguities of contemporary genomics – how novel forms of governance are inscribed into genomics institutional design. Reardon is insightful in describing how big genomic programs are imbued with moral and political aspirations—enrolling people in genomic initiatives, promoting a cosmopolitan ethic of care, making space for community consultation, favouring citizens’ control of genomic data—that often turn out to be of limited value or just illusory. She offers interesting comments on the contemporaneity of postgenomics with the rise of major players in digital capitalism such as Google, Facebook, and Amazon." "Reardon is especially interested in genomics’ role in augmenting or undermining conditions for justice and democracy. The book reads like an unfolding story with a clear narrative and argumentative agenda. She cogently argues that much of genomics research, while masquerading as a vehicle for liberal democracy and justice by revealing our common humanity, fails to create the conditions needed for a more democratic and just society." "How to think —how to make common meanings, how to live thoughtfully with oneself and others, how to consider things, actual things—in a world of endless genomic information and deluges of data is the key question of this marvelous, world-travelling, story-filled book. My favorite chapter takes the reader along Third Street in San Francisco, from glitzy new precision medicine and pharma buildings to a closed reproductive clinic that served mainly black and brown women. Good intentions, democratic and liberal idioms, and vast investments in digitization, but not in people, braid together to shape the heavily capitalized, sharply unequal postgenomic condition. This is a searching, research-rich, generous book, attentive to the dreams and worries of researchers and investors as well as ordinary people. It is a book that studies unending promises with a historically informed eye, while still holding open the possibility that genomic worlds are not fixed, not finished, but still in formation, still thinkable."